The three models in the J-Series – Model J-25, Model J-45, and Model J-45 with 1 Hp. upgrade – are the options for a compact industrial shredder that creates a reliable and cost-effective solution for your security needs. They accommodate general office use in one or several locations throughout your company, as well as higher capacity use for large departments within a corporation. Allegheny’s 16-Series Shredders are designed for used by a single operator and offer quiet, versatile, and powerful destruction of your paper and cardboard. The Allegheny Cross-cut Shredder is made specifically for paper shredding companies who want the throughput volume of an industrial shredder, but also have the need for a smaller, more secure shred size. The Allegheny 100-series industrial shredder is designed for one or two operators and can process from 1 to 2 ½ tons per hour. These industrial shredders are ideal for starting an off-site paper shredding service or for large institutions with centralized shredding for several locations. The extremely rugged 1000-Series are the ultimate industrial shredder, built to withstand the most demanding applications – with capacities ranging from 3 tons to 25 tons per hour. Maximum productivity comes using an Allegheny Auto-Feed™ System. To maximize your productivity and reduce your labors costs in high volume applications, Allegheny can custom design a Complete Shredding System incorporating optional equipment including conveyors, tippers, balers and auto-feed systems. 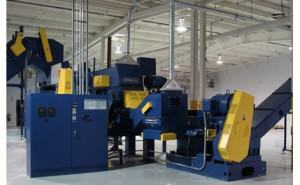 A complete system will also enable you to generate recycling profits from your shredded paper. 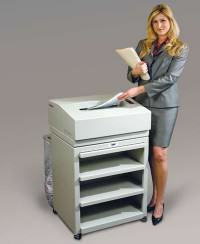 This innovative technology developed by Allegheny provides the most secure destruction for high volume applications. Utilizing a two-stage shredding process, Cross-Shredding results in a much smaller shred size than conventional strip-cut shredding, offering the maximum level of security. 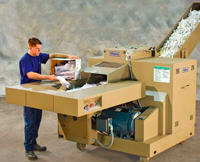 Cross-Shredding technology is not only cost-effective, but it significantly increases your system’s overall throughput.